For the USSR, 1947 marked the thirtieth anniversary of the 1917 October Revolution that ushered the Bolsheviks under Lenin into power. Coming just two years after the end of the Second World War, the year also marked the emergence of the Soviet Union as a global superpower who controlled vast swathes of territory in Eastern Europe (under compliant local rulers dependant on Moscow for support). The post-war narrative also heavily emphasised the victory of the competing economic systems (after all hadn’t the communist Soviet Union defeated the Germans? ), but it also consolidated the personal power and control of Stalin as arch-dictator, whose rule during the initial German invasion had looked increasingly shaky. Now, the wartime compromises and promises made to the people of the USSR were being slowly rolled back, terror was returning, those who had shown initiative during the war were now increasingly regarded as potential threats to be crushed, while the tensions between the former wartime allies were rapidly turning into a state of fear that would consume the world for the next forty years. 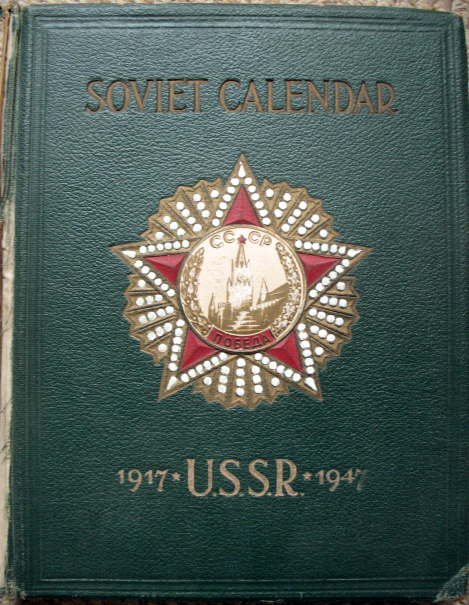 This book, despite its name, is not an actual calendar, more an encyclopaedia celebrating the accomplishments and achievements of the USSR over the previous thirty years on a month by month basis. The overall message is straightforward: under the guidance of Stalin and Lenin (but mainly Stalin or you risked going to a prison camp) the USSR has evolved from a backward agrarian country into a global power. 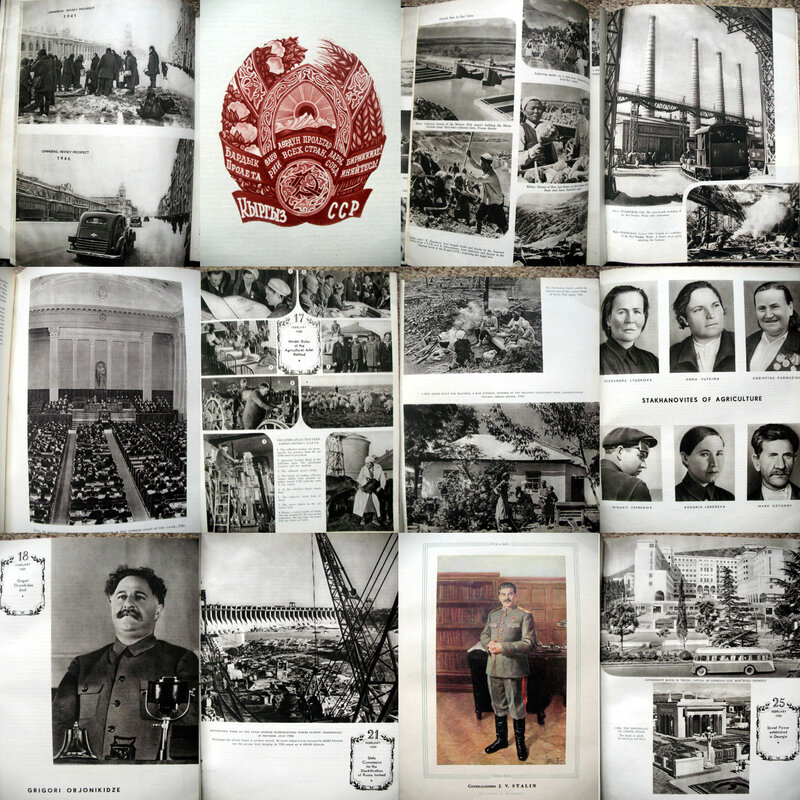 Tangible accomplishments are presented in terms of the development of a new society in which a communist utopia was being created (under Stalin’s control). Like the plot of Orwell’s 1984 come to pass, the book is an attempt to rewrite and reconstruct a version of history in which the triumph of communism is presented as inevitable. Although the dictator dominates the everything, space is permitted for acceptable heroes and role-models that embody the virtues of blind loyalty and self sacrifice (i.e. fawning, opinionless yes- men and women) who are presented as embodying the ideal for those who lived under this regime. Literary and other artistic figures who survived the purges of the 1930s (usually by informing on their peers to the secret police) are also valorised as embodying the vibrant, thriving culture of this new revolutionary society under construction. Similarly, space is devoted to prestige projects that appear to demonstrate the accomplishments made during the Soviet period, mainly around agriculture and industry, the twin pillars of communist society. Naturally, the book only shows the successes; the downsides and human costs of this vast social experiment are ignored. 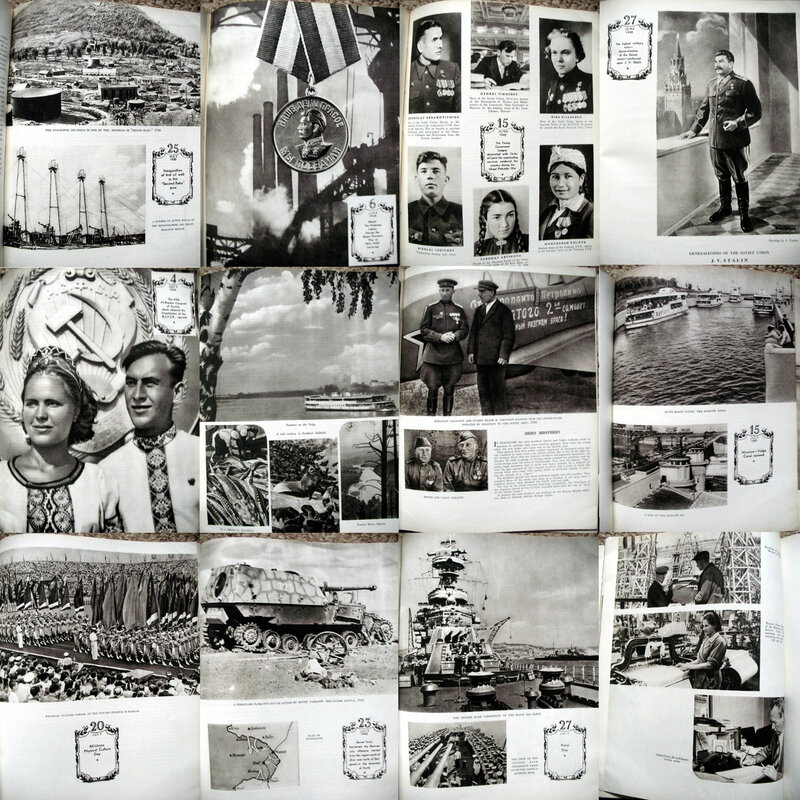 Design-wise the book is an interesting example of the evolution of Soviet propaganda. (Alas, the binding appears to have been very poorly done and finding a copy that has not split open over the past sixty years is a hard job.) Gone are the experimental techniques of the early 1930s as socialist-realism has taken root as the only permissible way of visualising the great leader and the paradise he has created. For photography, this meant that every image should convey a singular, unambiguous meaning that could be easily understood by everybody (particularly the censors). 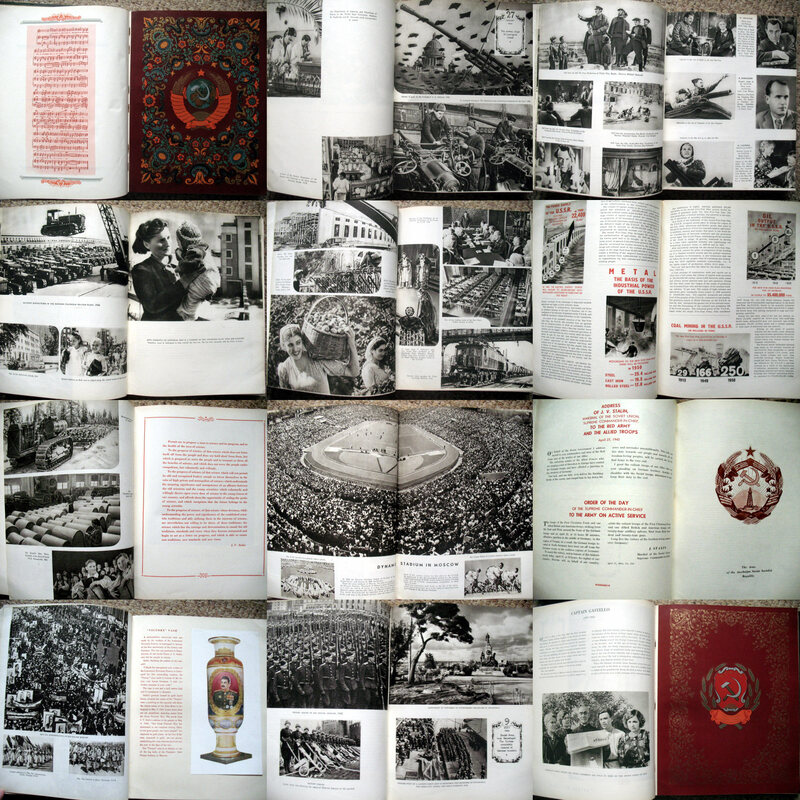 The book uses colour in places to convey the positive message of the USSR on the way up and separate pages display the various national symbols that made up the constituent countries of the Soviet Union, the national anthem is presented in bold red text, sayings of the great and good are emblazoned in red, while tipped in colour photographs show the great leader himself presiding over this display of might and unity. 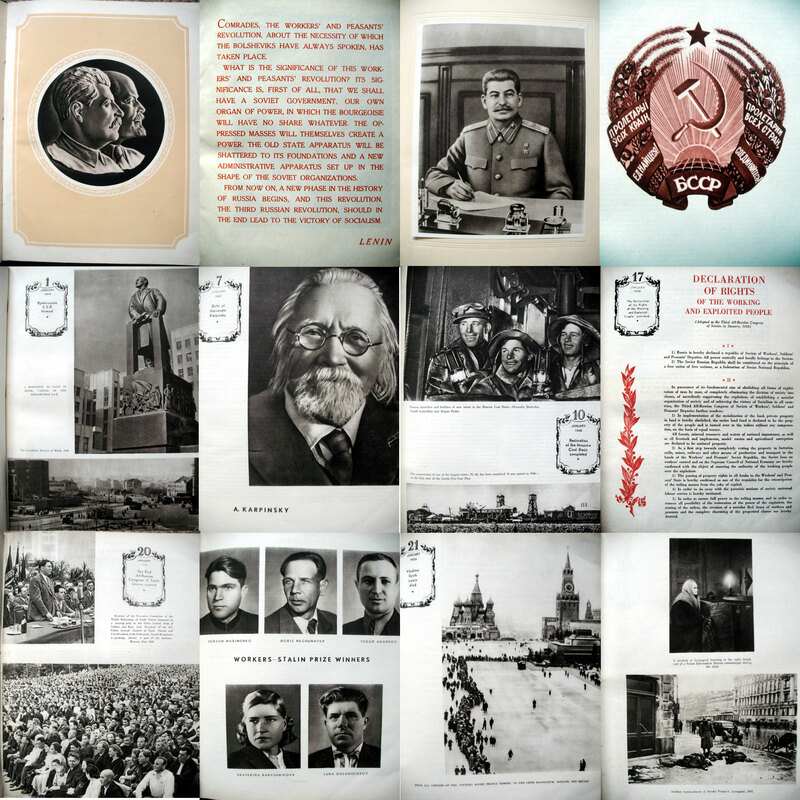 Photographs dominate the book and are used to illuminate the anniversaries of the assorted heroes, accomplishments of the regime and the cult of personality surrounding Stalin that constitutes history according to this book. Uncredited, these images show us a procession of martyrs whose example is held up as being the supreme example of how people should behave in Stalinist society. Two years after the end of the Second World War, a deeply traumatised society was still trying to come to terms with the horrific loss of life that it had just endured in fighting the Germans and were desperately trying to repair and rebuild a shattered country. All this was taking place in the menacing shadow of their unpredictable psychotic leader who, by all indications, fully intended to reinstate the regime of terror he had instituted in the 1930s that had seen millions killed or sent to prison camps. 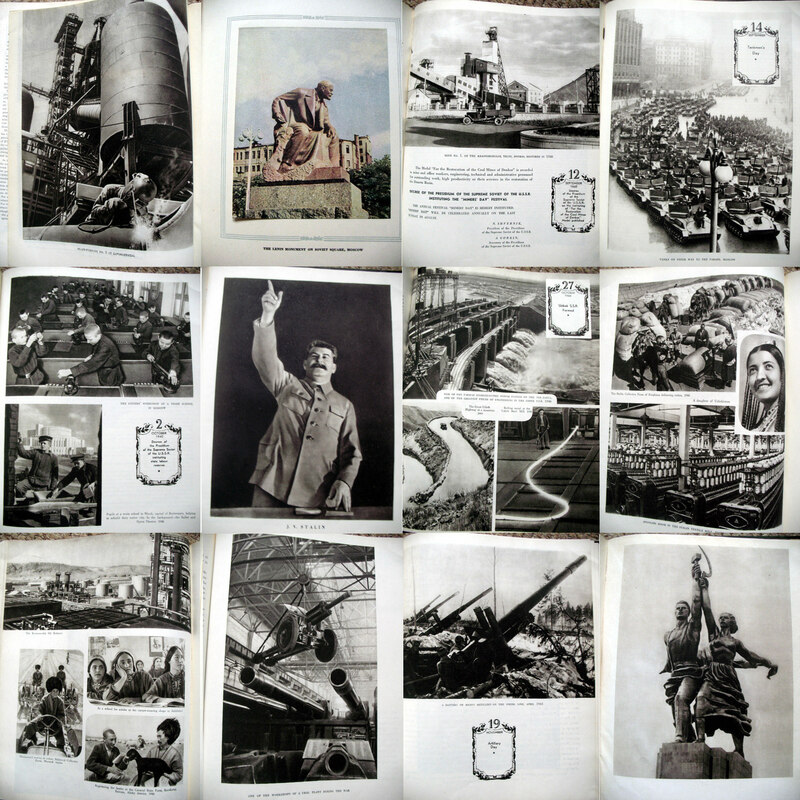 Similarly, industrial scenes show how the USSR under communism has emerged from agrarian backwardness into becoming a world power to rival the US and the rest of Europe, while the reconstructed new-towns and cities are presented as proof of the care the state takes in looking after its loyal and happy citizens. Photographs of heavy industry, belching factories and steel plants are ideologically loaded, becoming images of a global superpower, more than capable of taking on the Western world. 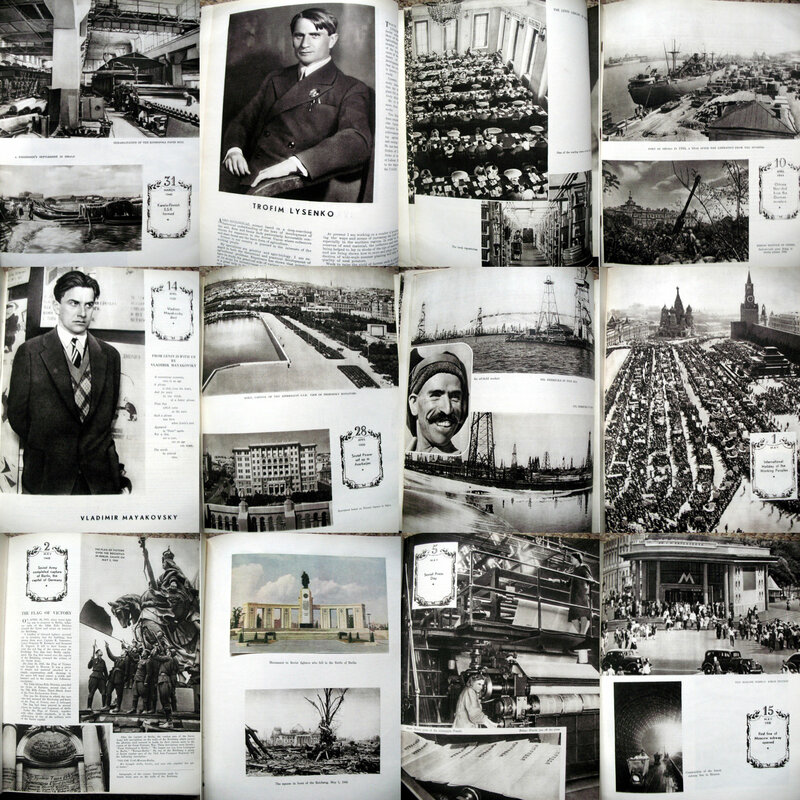 Similarly, photographs that show spotlessly clean, modern cityscapes, dotted with cars, populated by well dressed and happy inhabitants are used as proof that the utopia promised by Marx has come to pass under Stalin. Of course, the reality was very different. But the real purpose of this book is to prove that Stalin’s rule has been a success. The cult surrounding him had grown to massive proportions by this period and everything in this society, all art and culture, was devoted towards valorising his dictatorial reign. He is presented as a god-like figure, all-knowing, ceaselessly devoting his life towards improving the lot of the common man as well as single-handedly winning the war. Actually, the book format is almost biblical: communism is the new religion, Stalin is the messiah sent to save the world, the heroic Stakhanovite workers are saints, the Second World War was a test of faith, while the industrial and agricultural development are miracles that prove the validity of the new ideology. But the cracks were starting to show in Stalin’s rule by this time: too many people had demonstrated their ability to think for themselves during the fight against the Nazis and the balance of terror that had prevailed in the 1930s no longer worked as effectively in a society exhausted by war and devastation. The fact that after his death in 1953, the cult was quickly dismantled with little protest from the general populace showed just how shallow were these claims of popular acclaim. The 1991 Gulf War showed just how far the US military and political establishments had come in devising strategies to control and censor information in order to maintain public opinion. Key to this was the promulgation of a simplistic narrative about a crazed dictator and a coalition of allied nations uniting to free an occupied land and people (a strategy that clearly appropriated themes from the Second World War and distanced this conflict in the public mind from Vietnam). Even the names, such as Stormin’ Norman leading Desert Storm, were carefully chosen to resemble something out of a cheesy 1980s Schwarzenegger/Stallone action movie, familiar to audiences of the period, with a simplified plot, clear distinctions between the good/bad guys and a moral relativism that celebrated the use of violence on the part of the good guys but condemned the bad guys when they behaved in the same manner. After Vietnam, reporters and photojournalists were regarded as threats and potential enemies who might undermine the carefully managed fiction being produced by the military and political spin-doctors. Therefore they were carefully managed throughout to ensure that what they reported didn’t contradict the overall message of a bloodless war. Although CNN provided constant coverage of the conflict on a scale heretofore unknown, the imagery produced was surprisingly limited. Lots of soupy green night-vision video from the roof of Baghdad’s Rashid Hotel and carefully chosen footage from so-called smart bombs hitting their targets with pinpoint accuracy were the motifs of this war for a distant audience. This produced a distancing effect, turning it into a video-game that precluded any identification on the part of the viewer with the end results produced. Death and suffering were subjects that were conspicuous by their absence in this spectacular display of power. In this tightly controlled environment, very few images managed to depict the carnage caused by the much-lauded smart bombs that had convinced the Western world that it could engage in war without consequence. While the war went on for over a month, it was only towards the end of the period that images showing the effects of war emerged. 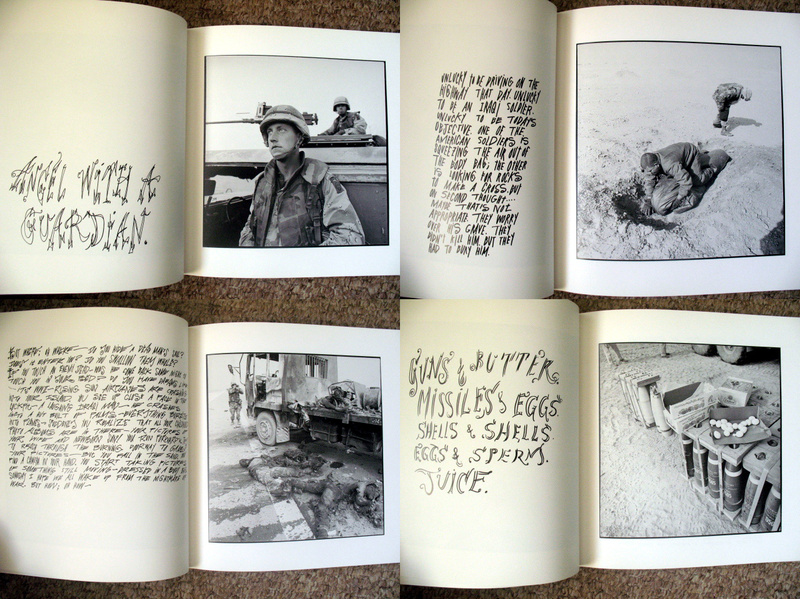 In particular, Kenneth Jarecke’s searing image of a badly burnt and disfigured Iraqi soldier sitting in the cab of a truck has assumed an importance insofar as it undermines the officially sanctioned narrative. 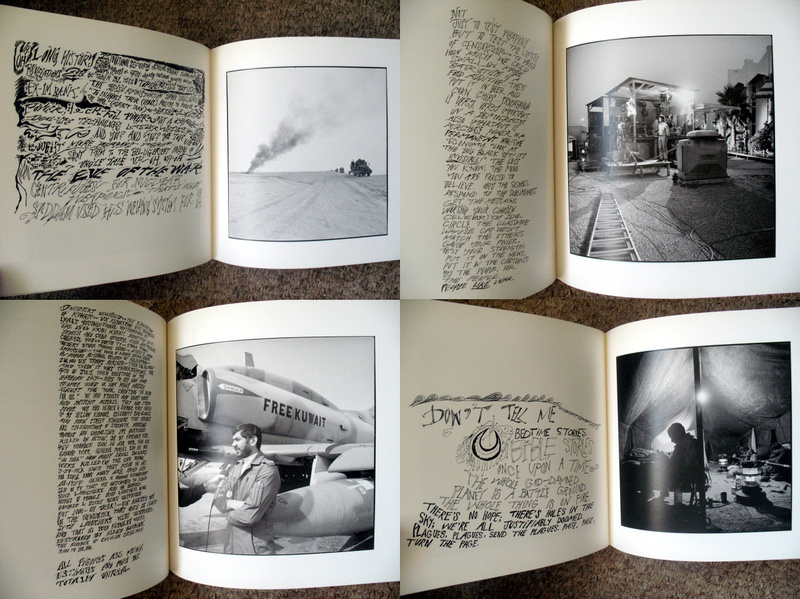 Published in 1992 by Bedrock Press, this book is a collection of images taken by Jarecke alongside texts by Exene Cervenka and is one of the few photobooks to emerge in the aftermath of the first Gulf War that criticised the narrative of a (then) very popular war at a time when challenges to US global power were almost non-existent. 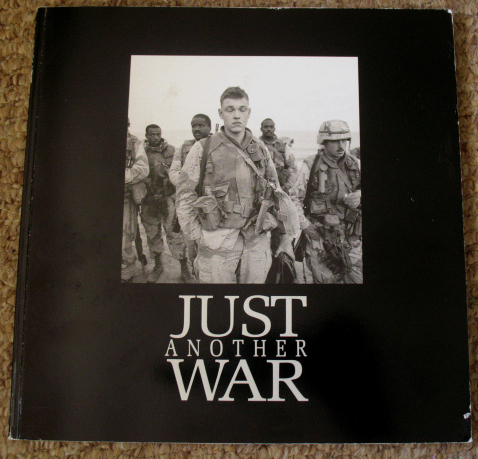 The largely celebratory manner by which the first Gulf War was represented contributed, in part, to US public support for the second war against Iraq in 2003 because it was assumed that it would also be a quick and easy victory, the carnage would remain unseen, and American casualties would remain light. That proved not to be the case. 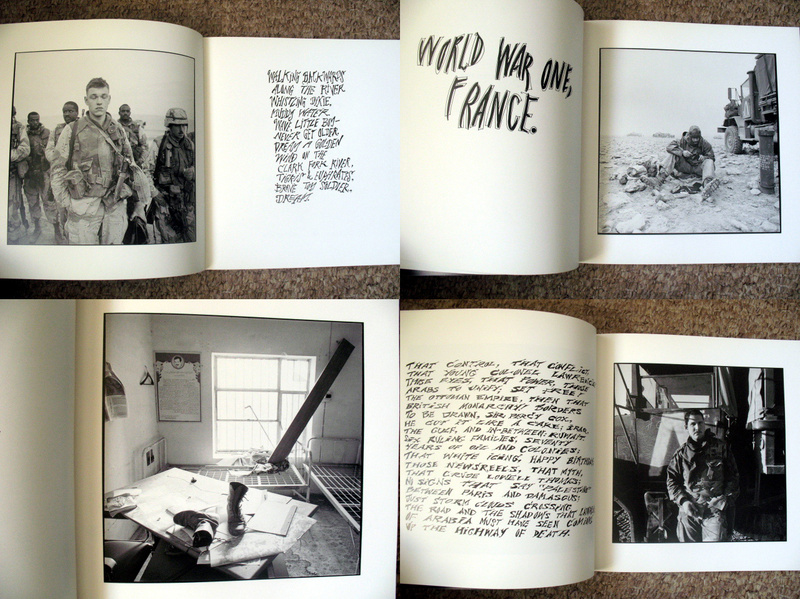 Dispensing with the standard 35mm format that was the camera of choice for photojournalism at the time, Jarecke presents a series of square format black and white images depicting his experiences during the war. 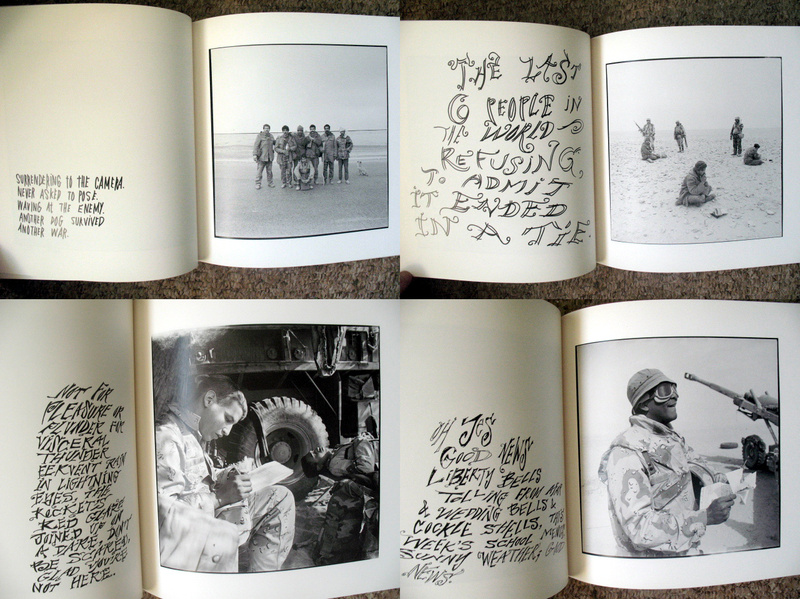 Printed in high-key, due to the harsh light of the region, much of the photographs depict coalition soldiers either during periods of boredom or inaction, echoing the fact that photographers were kept well away from the realities of warfare. This also reflected that for much of the conflict, the actual soldiers had nothing to do as the air bombardment of Iraqi forces went on for a month before the famed 100 hour land offensive occurred. Thus, for photojournalists with the coalition forces the effects of this warfare remained almost totally invisible until the last few days of the war and by then the smart-bomb/night-vision narrative produced by the media had become firmly embedded in the public consciousness. The new technology of Western warfare was celebrated while the consequences remained invisible. 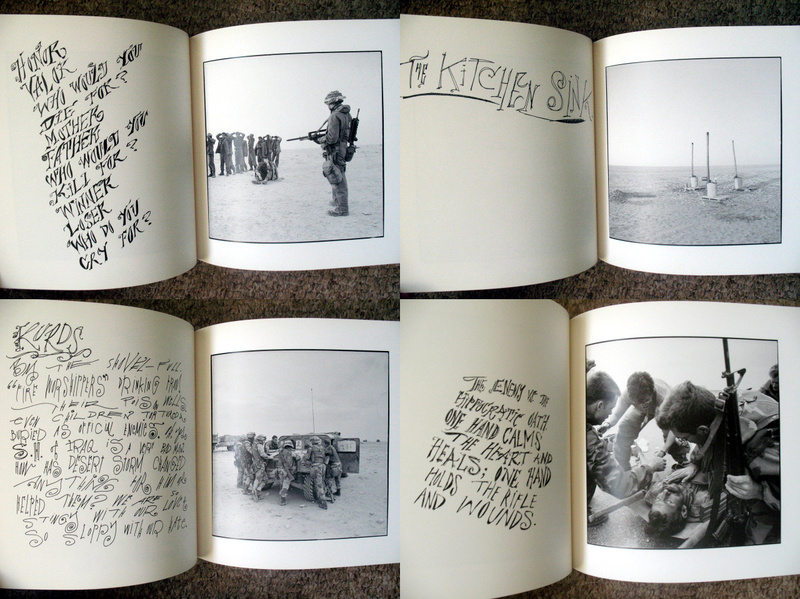 Jarecke’s images are combined with texts, of differing lengths, on the facing page by Cervenka that serve as an immediate personal response and a deeper critique of the jingoistic narrative, whilst attempting to place this conflict in a historical perspective. 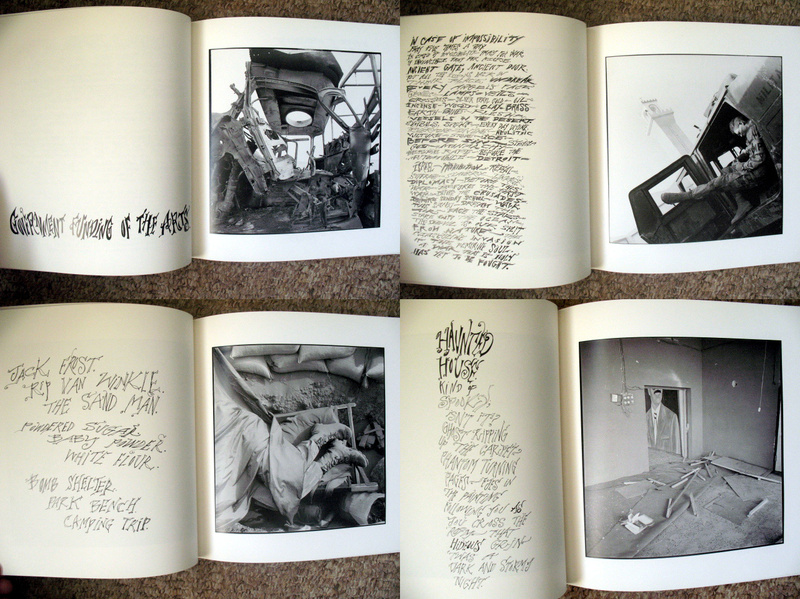 Certainly, from a typographical point of view, the text is very effective, producing a very personal commentary on both the photographs and the war itself. Cervenka’s text operates to contextualise the war, dissecting the simplistic narrative produced by the cheerleaders of Western power, tracing it back to the decisions made by now defunct colonial powers in the aftermath of the First World War. These decisions had the effect of destabilising the region in the pursuit of imperial ambitions that have long since been consigned to the dustbin of history. Cervenka also examines the ambiguous relationship between Saddam’s Iraq and the United States in the decades prior to the war, the military-industrial complex and an oil dependent economy. 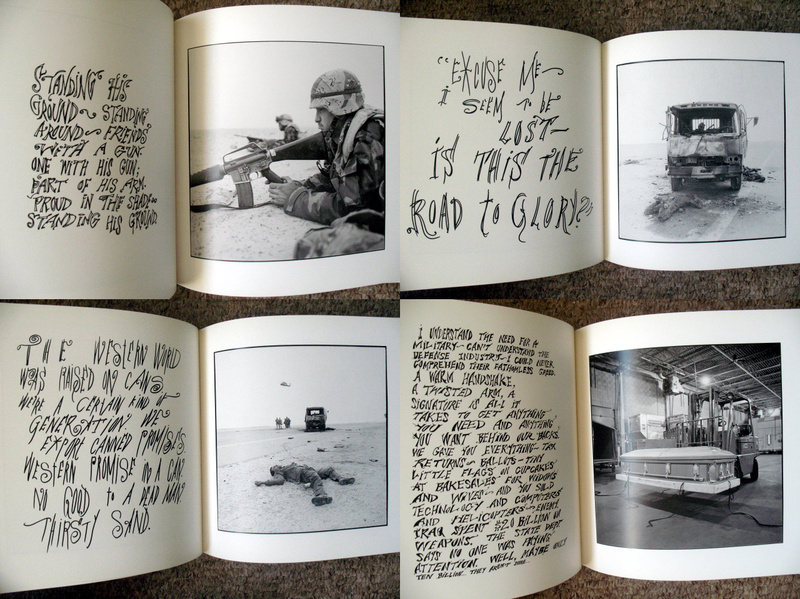 But what really made Jarecke’s visualisation of this war stand out was his iconic image of the blackened, incinerated body of an Iraqi soldier bent over a steering wheel, framed by the empty windscreen of a burnt out truck. As well as being one of the few images that depicted the realities of high-tech warfare (and showed that the end result was just as brutal as ever) the photograph was particularly effective in that the anonymous man’s gaze met that of the viewer, staring out in a grimace of unimaginable agony. According to Jarecke, they came across a single truck on a highway which had been recently attacked from the air. 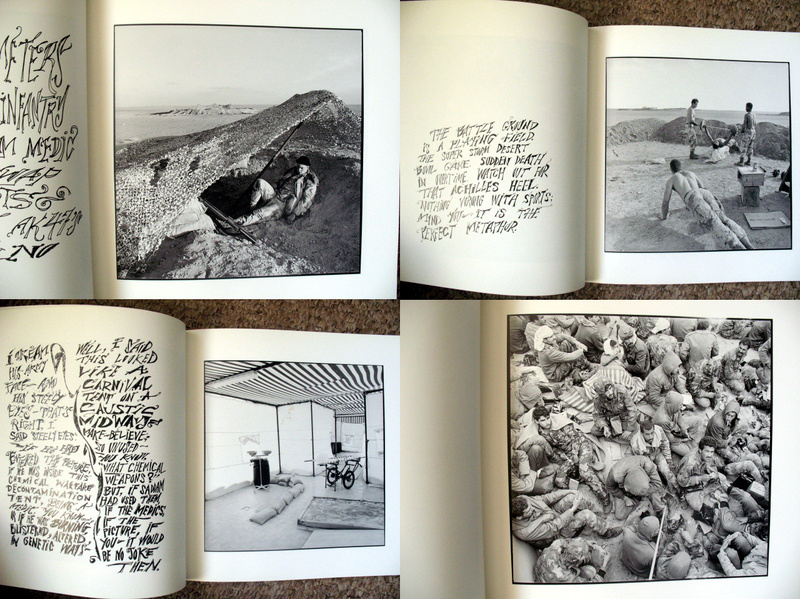 While that single image has assumed an iconic status and has become one of the few depictions to challenge the official rhetoric, the book contains a number of other images made of the same scene. (It was only published by the Observer newspaper at the time – Time magazine wouldn’t touch it despite Jarecke being under contract to them.) If the news media found printing that particular image problematic, then the other photographs Jarecke made had no chance of appearing in newspapers. The horrific realities of so-called smart-bombs are laid bare in these few images of disembodied corpses representing undermined the video-game/action-movie narrative adopted by the media. If the authorised narrative privileged distance and the elevated perspective of technological awe, then Jarecke’s images depict the grim results on the ground. But from the American military’s perspective, they achieved their objective of maintaining public support for the war through tightly controlling how it was represented to a distant audience. This strategy would have profound implications for the future.